I have spent the majority of my twenties on a quest to figure out my go-to drink. The rum-and-cokes and whiskey-gingers I knocked back in college, now feel far too sweet for regular consumption. Old Fashioneds and negronis, while decidedly not sweet, feel far too boozy for regular consumption. Like Goldilocks, turns out there was a third option that was just right -- bitters and soda. While it doesn't exactly have any booze -- only the minuscule amount contributed by the bitters -- the drink is effervescent and perfect, especially after a heavy meal (a hazard of my job). It also doesn't have the cloying sweetness of soda. While seltzer is easy enough to find, the only problem is I don't always have a bottle of bitters on hand (alas, people do not carry bitters in their bag like hot sauce). That's where a genius new product from Hella Cocktail Co. comes in. The brand, best known for its expansive line of bitters, just released canned bitters and soda where all the work is already done for you. It's as easy as drinking a soda, but just way more pleasant to your tastebuds. There are two flavors, Dry and Spritz, and they are both crafted with a tincture made from the Gentian root (a plant that is popular in many cocktails and the South of France). The Dry is, well, true to its name. It's perfect for people who don't love sweetness whatsoever. It's also very heavy on the allspice and sort of reminds me of Christmas dinner but as a seltzer flavor. I personally couldn't stop drinking the Spritz version, which is slightly sweeter and is an aesthetically pleasing shade of vibrant pink. The drink is refreshing and spiced and something I want poured on the rocks and served with a twist. Both flavors are designed to be drank on their own, straight out of the can, or as a mixer. Both would be extremely good mixed with a couple ounces of Aperol in particular. 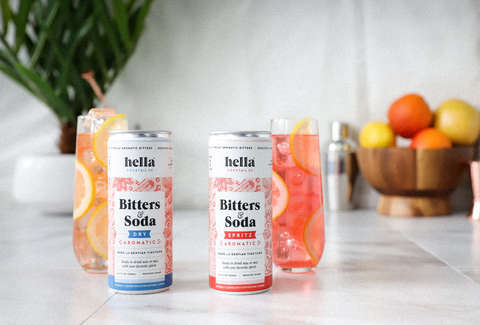 The Bitters and Soda will be available starting May 1st through the company's website, and will retails for $9.99 for a four-pack -- or less than what most bars will charge you for the drink. Khushbu Shah is a senior food editor at Thrillist. She is also a huge fan of amaro and soda on the rocks with a twist. Follow her extremely tame drinking habits on Twitter @khushandoj.